Great news! We heard from the developer today that their landscaper will be returning in September to replace any trees they planted last year that have since died. So between now and the replacement operation in September, please do not remove any dead spruce trees from the November 2016 planting. And if you have a dead tree from that batch that hasn’t been reported to Jascinda at Farmers, please do ASAP. 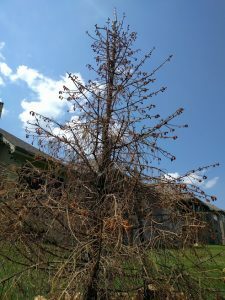 One of the evergreen trees in our back yard was killed by a lightning strike this summer. As we are new, I do not know if this tree was planted 11/16 but feel sure that because of the lightning damage it will not be replaced by the landscaper. We have contracted to have the tree removed by Ryan Tree Service but do not plan to replace it as we have an abundance of trees. We also have contracted with Ryan to trim the large Honey Locust trees (eleven) on our back lot. Some branches in these large trees were also damaged by the summer storms and might pose a danger if not attended to. I hope that this is ok with the landscaper and the HOA. https://timberridgevillas.com/architectural-committee/ and send to Feedback@TimberRidgeVillas.com when complete, or hand to any of the AC members, Chris, Mike, or Lindsey. The city may also have tree requirements that could require the tree be replaced instead of removed. To check with them, call Merriam Codes Dept at (913) 322-5520.